John Paul and Wayne are two young men in search of their fathers. Problem is…their fathers have been dead for 25 years. Eddie and Steven are two young men in search of their sons…whom they’ve never met. In 1969, Eddie and Steven are with their squad deep in the jungle of Vietnam on a five-day mission to retrieve fallen comrades. They write letters to their wives, often mentioning their love for their sons, one, who is an infant and one yet to be born. In 1994, John Paul and Wayne go on a five day road trip to the Vietnam Wall in Washington DC to see their fathers’ names. Along the way, reading those letters, they begin to get an understanding of who their fathers were and how they died. Trials and mishaps, both funny and sad, complicate the road trip for the boys. 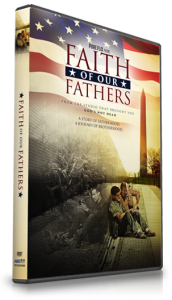 The horrors of war and the testing of faith manifest themselves for the young men in Vietnam. Ultimately, in parallel stories – 25 years apart – the fathers and sons are bound together forever. 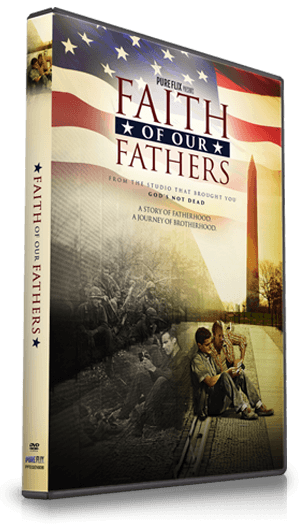 Faith of Our Fathers is a really great movie! I sincerely enjoyed watching it! I especially enjoyed the mishaps and craziness on their road trip, especially laughing at the comic relief brought by Si Robertson. While Stephen Baldwin demonstrated his lack of ability to act, with some effort I was able to overlook him and get back into the story. I sincerely feel like Baldwin took away from the story and overall film and wish they had chosen to go with a more talented actor. The rest of the cast did a great job telling the story. David A. R. White was amazing as Wayne, one of the two main characters. I don’t think anyone could have played that role better! Overall, I am glad I had the opportunity to watch this film. I love that Christian films are getting better and better!